I have the following dump in Crashlytics that I'm not able to recreate at all. I don't know where in the App it occurs. 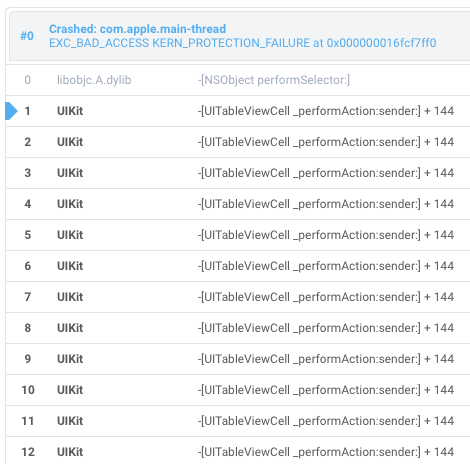 This continues on for another 510 identical [UITableViewCell _performAction:sender:] + 144 stack frames, which is Crashlytics upper limit. It very much looks like a stack overflow to me. I'm stumped as to tracking down the cause of it though. UIResponder has a mechanism to provide a handler for a received event: targetForAction:withSender:. I can imagine this could lead to an infinite recursion, but I'm not using this method in my code base. This isn't a lot to go on, I realise! I'm hoping someone who's seen something similar might be able to hypothesise some possible causes. I don't know which of this application's view controllers or dozens of cell classes is causing the crash so I can't paste that code in here. Can you suggest what else might might lead to the stack overflow recursion seen above? Also useful would be ideas about how I might determine the problematic piece of code. Could I perhaps swizzle _performAction:sender for UITableViewCell to log when this call is used? Then I could try the various areas in the App and see possible culprits? Browse other questions tagged ios uikit stack-overflow uiresponder or ask your own question. Is a stack overflow a security hole?